1. 60 Day Money Back Guarantee! 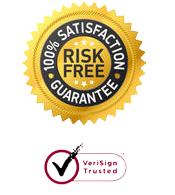 100% Risk Free! 2. Platform: Mac OS 10.6-10.10. 3. Please do not enter your name with non-English characters or symbols in case that the registration information to be sent to you will be invalid. 4. You should receive an email with registration name and code shortly. Please check your inbox a while later. 5. If you do not receive your code after several hours, please check your spam filtering in case that our registration email gets marked as spam and sorted into a "junk" folder or deleted. 6. The online ordering is 100% secure! All data exchanged during the payment process is SSL-secured. Our servers support SSL Version 3 and 168-bit Triple DES encryption, and the RSA module and SSL sessions feature 1024-bit encryption. We leave nothing to chance when it comes to security.